We go camping at Easter. It’s our thing that we do. That we’ve always done. In fact, the Bread Winner and I met at Easter camping 14 years ago. It’s like our personal Mecca. This year though, things fell apart. The trailer has two flat tyres. It needs new rims. Easter is extraordinarily early. We were away only two weeks ago. In short, Easter arrived too soon and caught me unprepared. So no camping this Easter. I’m a little sad but also relieved that I avoided all the work involved. What camping at Easter has meant is that we have been able to avoid Easter and all it’s chocolate trappings. It just hasn’t been a blip on our radar. This year, the lack of camping plus Son and Heir’s entry to Kindergarten has changed all that. Early in the week, I picked him up from kinder to be told that the Easter Bunny was going to come to our house and leave eggs. I cringed a little inside and asked what the eggs were. Oh, just eggs for Easter he said. Phew, he didn’t know about the chocolate. Two days later, my temporary relief was shattered. I picked him up from his last day of term and he was wearing bunny ears, carrying his paper egg basket and it had chocolate eggs in it. It’s all over. He KNOWS. I suppose I should be happy I got away with four and a half years of ignorance. With lots of aunts and uncles ready to spoil, I certainly won’t be contributing to the chocolate madness myself. I would like to have some sort of tradition though. I thought about dyed Easter eggs but of course had concerns with using artificial food colouring. Not just ideologically but practically as Son and Heir has a massive intolerance to artificial colouring. The results are not pretty. Never fear, dyed Easter eggs pre-date artificial colouring. So I dyed two eggs per Ankle Biter. To save bickering, I wrote their initial on each of their eggs in crayon. The dye will not stick to the crayon. Using two small pots, and two eggs per pot, cover the eggs with water. To one pot, add 5 tablespoons turmeric. To the other pot, add handfuls of dry outer onion skins (I used a mix of brown and red). Bring pots to the boil and simmer for 15 minute. Remove from heat and place in the fridge. Leave overnight for a darker colour to develop. The turme1ic didn’t work very well but the onion skins did a great job. The kids were thrilled to bits and that is the main thing. 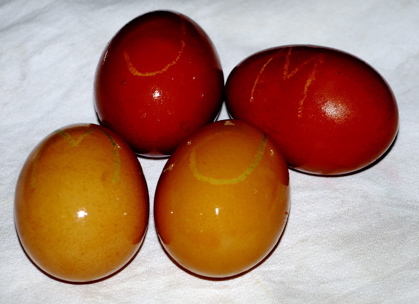 Perfectly edible, naturally dyed eggs for Easter morning. Lovely. The colour isn’t as intense as I could have achieved with artificial colours but I figure it a worthy tradeoff. Love the onion skin dyeing! Such a rich colour.